Scientific calculators are now a requirement for most higher-level High School courses, so chances are you’re going to have to pick one up at some point. We’ve put together this handy buying guide to help you narrow it down to the best scientific calculator for you! Some courses require very specific ones, but we’re here to help if it isn’t so easy to tell! Let’s take a look at some things you should know before you start shopping. Battery Type: You will need to know the type of battery if you’re going to be using your calculator in the long-term. Most are solar powered, but some have exchangeable batteries as a backup. It’s great to know! Color: The color of the calculator is a personal decision that doesn’t affect how it functions. However, it can definitely be one of the deciding factors when you’re shopping for calculators! It’s entirely up to you! 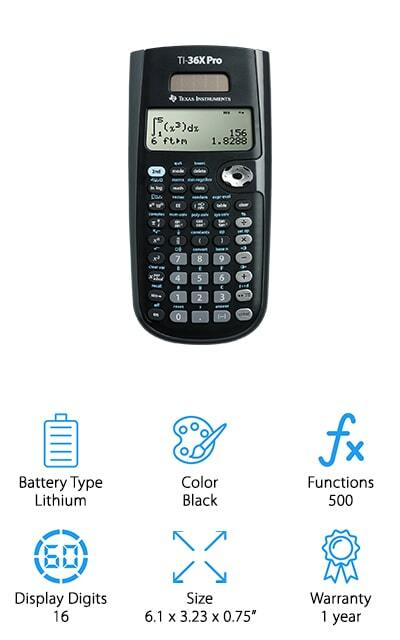 Functions: The number of functions tells you how much the calculator can do. More functions mean that it’s more universal and useful for various classes and subjects, which is a definite bonus. Get one calculator for all classes! Display Digits: The display digits refer to the number of spaces across the screen has for numbers and symbols. A larger number means there is more space for complicated equations. These calculators are better for calculus and trigonometry. Size: The dimensions of the calculator are important if you’re looking at the button-to-screen ratio as a factor. It will also tell you where you can carry it, and if it’s going to be convenient to carry around. Warranty: The warranty protects you and your purchase if the calculator is defective or stops functioning due to a manufacturing error. Within this time frame, you can get a refund or replacement for these errors if you’d like. You have a pretty good idea what you’re looking for, so now we can get to the calculator reviews. We’ve selected only the best scientific calculators for you to browse, including some of the best for a wider variety of subjects. The top pick and budget pick are our favorites, so start there before moving on to the rest of the list! We’re sure that you’ll find your next long-term calculator on this list of the best! Our choice for the best scientific calculator for engineering is the HP 35s. It’s good for a variety of professions including engineering, medicine, and other science careers. It’s going to be extremely handy if you need a calculator for some of these things. It’s packed full of useful features, such as adjustable contrast, a variety of different characters and indicators, as well as preprogrammed SAT tests. There are over 100 built-in functions, as well as 800 memory registers and 30 KB of memory. The battery life with the provided batteries should be about nine months, so it will get you through most of the school year without needing to change them. We love that there’s so much that this calculator can do! It also supports college-level Chemistry and Physics functions so that you can do everything you need to get done on a single device. We love all the different buttons and features that this scientific calculator has! Our budget pick is also our pick for the best scientific calculator for high school. Texas Instruments has been used to get students through their coursework for years, and the TI-36X Pro is better than those that came before. 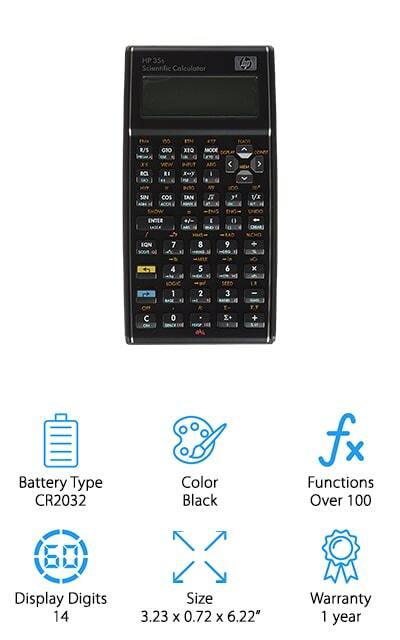 It’s got about 500 functions, which are good for Algebra, Geometry, Trig, Statistics, Calculus, and even some science courses like chemistry and biology. Everything appears on the screen as it would appear in a textbook, to help eliminate confusion and help you learn everything you need to know. 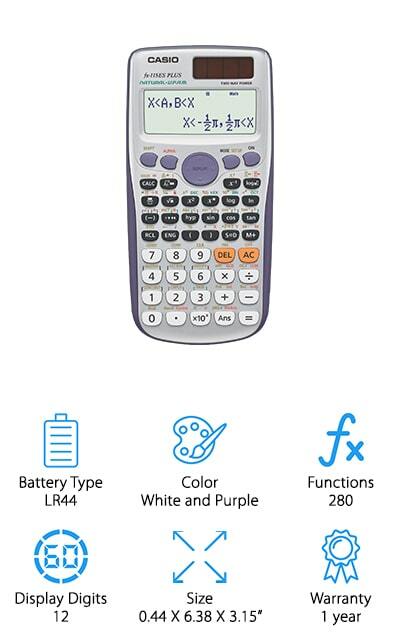 It’s great for classes where even the best scientific graphic calculator wouldn’t be allowed, as you still get the power without the graphics capabilities. Plus, you can have multiple calculations up on the screen at the same time, which is perfect for helping you show your work and figure things out through comparison. There are even multiple number modes to help you learn in your own way! We love it! The Casio fx-115ES Plus is a great calculator for general mathematics, and it’s even a great scientific calculator for chemistry and other sciences! There are over 280 amazing functions that allow you to solve even the most difficult problems and calculations, including standard deviations, linear regression, complex number calculations, and statistics. Fractions and other symbols appear on the 12-digit screen in the same way they appear in the textbook, so you can more easily make connections between what you’re seeing there and what you’re being taught. You can also backtrack through your old calculations due to the multi-replay memory function. 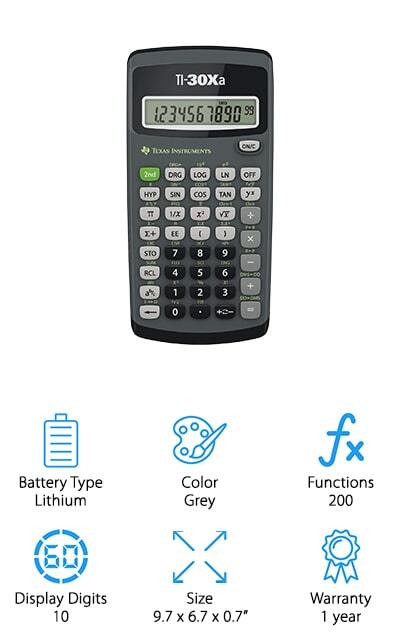 From high-level calculus and science to basic mathematics and first-level algebra, this calculator will be there through it all. It’s also a stylish white and purple color so you don’t have to sacrifice aesthetics for function. This calculator has it all! Plus, it’s allowed for your PSAT, SAT, and ACT exams, as well as AP and NCEES tests! This product by Sharp is one of the top scientific calculators that we found during our research. 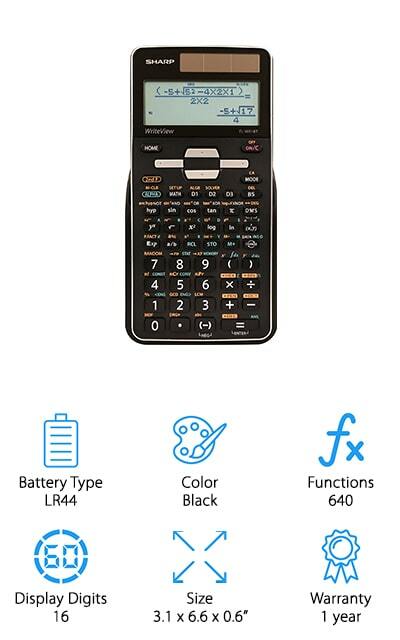 It has an amazing 640 functions that you can use, so you’re always going to be able to finish your homework, whether that’s in chemistry, engineering, or math! There are seven modes that allow you to accomplish a range of activities, including normal, stat, drill, complex, matrix, list, and equation modes. You can press the home key to start over from any screen, which is a nice feature for busy students! 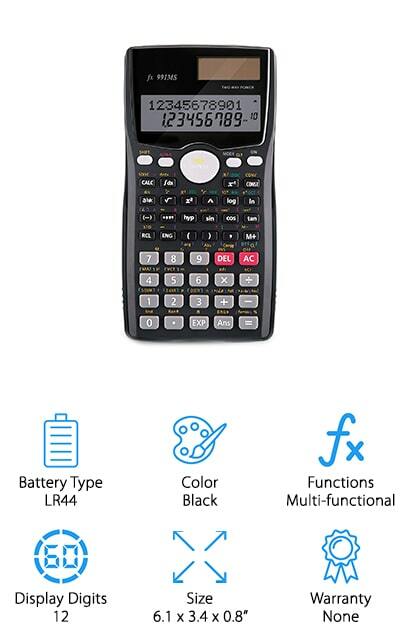 The 16 display digits and 4 lines on the screen make it great for solving more complicated algorithms, and there are 8 temporary memory slots, as well as quadratic and cubic equation solving modes. This calculator is a great choice for helping you do whatever you need to, without all the fuss and frustration. We love the sleek black look as well, and the WriteView display makes everything clear. 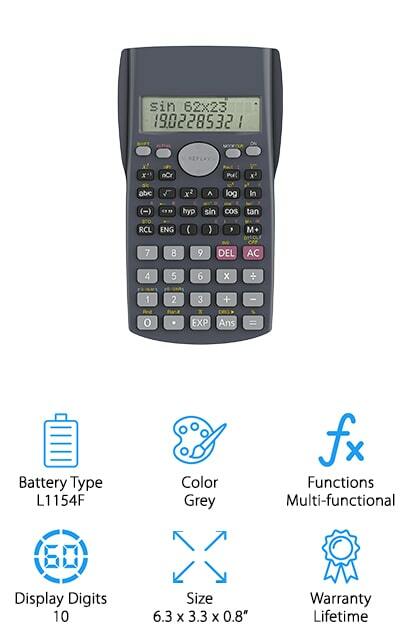 The Helect H1002 is a professional scientific calculator that can show two lines at a time. This is useful for reviewing your equation as well as figuring out the steps to get to the answer. So you can still see the equation when you get to the answer, which is a pretty amazing feature, we think. You can do variable statistic calculations, as well and engineering notation on this calculator, which makes it the perfect one for professional use. The cover is a slide-off hard case that keeps your buttons and screen intact while you’re carrying it around. It comes with two batteries, and these batteries are supposed to last two years. And you’ll absolutely want to replace them and keep using this calculator because it’s a smart investment! On top of that, Helect includes a lifetime warranty so that if anything goes wrong out of the ordinary, you can get a replacement! That’s pretty amazing. 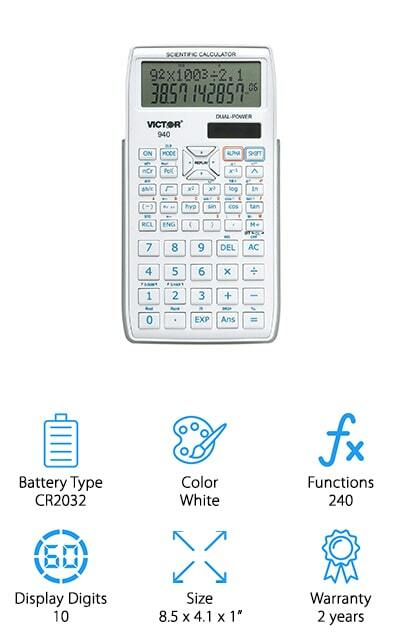 Victor makes this 2-line, 10-digit display calculator that boosts up to 240 amazing functions. 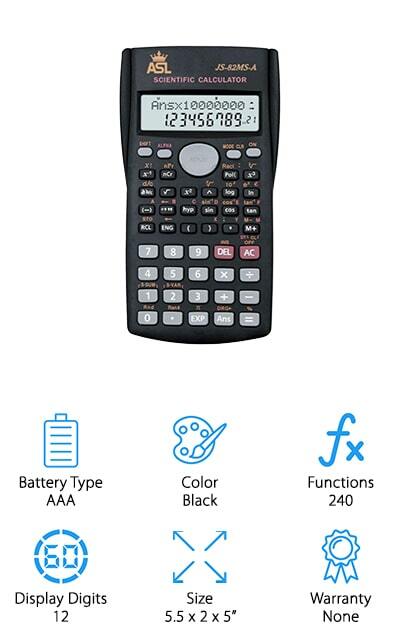 Because of the way that this calculator can be used for basic math, algebra, science, trigonometry, and geometry, this is one of the best calculators for engineering students. It includes the ability to solve quadratic and cubic equations, as well as trig functions and coordinate conversion. Whatever your problem is asking you to do, you’ll be sure to find the appropriate function on this calculator. It’s got a nice white design, and the cover is a hard case so the calculator screen and buttons are well-protected. It uses a lithium battery as a backup to the solar power option, which is pretty amazing in our opinion. You can use this calculator to solve factorials and reciprocals as well as all of the basic stuff, and the 2-line display makes it easy to show your work. With a screen like this, you can see everything! Texas Instruments is back on our list again with this simpler calculator that will give your equations a nice boost without solving them for you! This calculator is programmed to perform basic trigonometric functions as well as basic scientific functions. It’s great for lower levels of algebra and trig. Basically, if you’re fond of the idea of a calculator that will help you along the way to solving an equation without taking all of the work out of your hands, this is the calculator for you! It’s battery powered, and this battery will last a long time with infrequent use! As long as it’s not on all day every day, you’ll get several good years out of this comparatively inexpensive calculator. The display is a standard, easy-to-read affair with ten display digits across, so you can fit in the most complicated decimals as well as the simplest equations. Plus, this calculator can handle polar and rectangular conversions! ASL’s Advanced calculator is unique on our list because it uses AAA batteries instead of a solar backup or a lithium battery. Since these are easier to replace, we love this scientific calculator for college. The 12-digit, 2-line display allows you to see both the solution and the equation you’re trying to solve, which helps with confusion. It’s got a large screen to increase visibility! It’s comfortable as well! It has a replay function so you can go back and change the different numbers within an equation without having to re-enter all of the symbols and functions. Speaking of which, there are 240 different functions available in accounting, statistics, finance, trig, and algebra. It’s great for every level of skill and use, That’s one of the coolest features of this ASL calculator – you can use it for middle school math, but it’s also one of the best scientific calculators for calculus at the same time! Canon makes this solar-powered calculator with a battery backup. 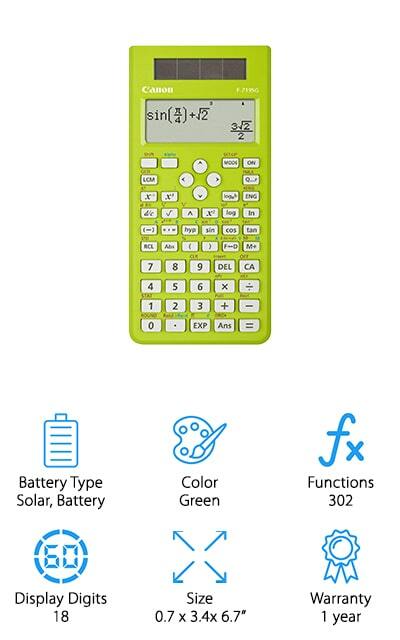 It comes in a pretty green color so you can get the style that you want without sacrificing function because this calculator also does about 302 different functions. There are 38 built-in formulas that you can plug the numbers into. This will help you make sure that you’re getting the answers right when you’re doing long homework assignments. The case is a hardcover that will protect your calculator and buttons with no additional effort, so you can feel confident carrying it with you everywhere you’ll need it. It can store different problems and answers so that you can access them later, which is a handy tool when you’re checking over the equations you’re trying to solve. The recalled memory is also a nice and easy to use the feature. It has 4 lines so you can see the last equations and answers all at once. We love that. Last on our list is this KDT scientific calculator. It is powered by button batteries that are easy to replace and are going to last you a long time. The two-line display allows you to see the problem at the same time as the solution, which is a great visual tool to help you learn while you’re figuring it out. There are three angle modes, including degrees, radians, and grads that you can use for geometry, as well as engineering notation mode. The screen is a high-definition LCD with clear letters and no shadow so that you can properly see all that you need to. This calculator is as useful as it is convenient, with a hard case and silicone pads to keep it right where you want it. You can get it right the very first time with this heavy-duty professional calculator. Invest in your success with one of the best and most useful scientific calculators!